StudyMalaysia Interactive DVD, (formerly known as the StudyMalaysia Interactive CD back in year 2003-2008) is an electronic media to complement the advertising effectiveness of the printed Guidebook and the StudyMalaysia.com website, which focuses on both lower and higher education opportunities in Malaysia but comes in CD form to cater to those without Internet connection and animation presentation. It is a yearly electronic media for school counselors and students as well as for overseas promotions. The CD-ROM (Version 1) was first introduced in year 2003, and ever since then, it has gained a reputation as a quality electronic media providing comprehensive and reliable information about where and what to study in Malaysia, the various study opportunities in the country, Government authorities, up-to-date information on the education system, an easy to search course directory, profiles of educational institutions and educational support services providers and many more useful information. The DVD is also frequently offered as a souvenir to the foreign counterparts of the Ministry of Higher Education, and it is also often made available at nation-wide education seminars and some international exhibitions. 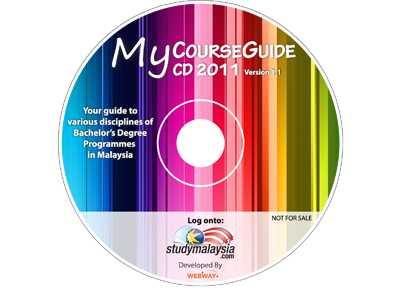 An interactive CD containing information about the various disciplines of Bachelor’s Degree Programmes in Malaysia. This first-of-its-kind CD also features course descriptions for Bachelor’s degree programmes and Career Choice articles. MY CourseGuide CD 2011 will help students, parents, school career counsellors and the public to have a better understanding of the curriculum structure of Bachelor degree courses offered by various institutions. It also gives the readers an insight into the career choice related to various areas of study. In particular, this CD will help upper secondary students and those aspiring to pursue tertiary level programmes. A total of 5,000 copies of will be distributed throughout the country.